Fairfield Ludlowe’s Lyla Vogel competes on the uneven bars during a meet against Fairfield Warde and Staples on Thursday. 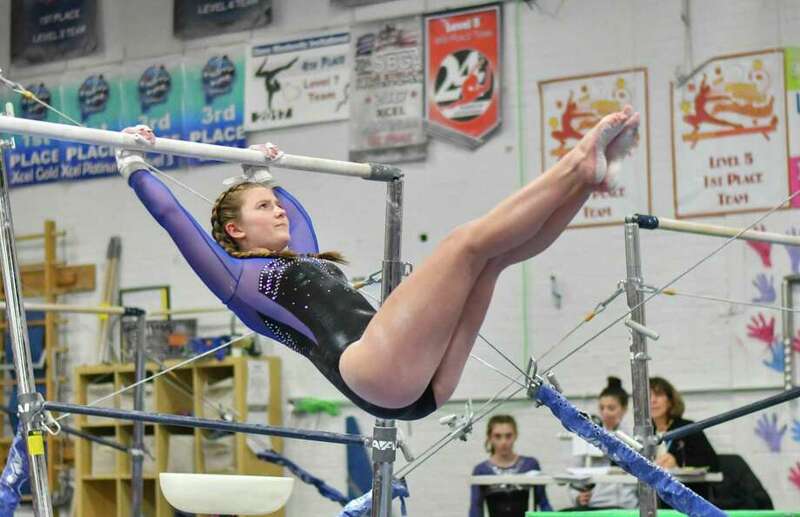 A team that is sure to make its presence felt at the FCIAC Girls Gymnastics Championships, set for Feb. 9 at 10 a.m. at Westhill, is Fairfield Ludlowe High School. The Falcons are soaring with a 10-0 record after Thursday’s victory over Staples (136.20-124.05). Ludlowe made its first statement of the 2018-19 regular season by topping nine opponents and scoring 133.70 points to capture the Pomperaug Invitational. The Falcons’ most recent successes were triumphs over two-time defending FCIAC champ Greenwich High (137.20-135) and Trumbull (132.85-128.65). Ludlowe has a core of experience in seniors Madison Cerny, Claire DeMaso, Evelyn Hogarth, Olivia Hurst and Georgia Sharpe. The Falcons’ future looks bright thanks to eight freshmen. At the center of Ludlowe’s regular-season dominance is sophomore Ava Mancini. As of the Jan. 29 State Open rankings, Mancini is ranked No. 4 in the state on vault (9.10 point average), No. 4 on bars (8.65), No. 3 on beam (8.9125), No. 11 on floor exercise (8.6750) and No. 5 in all-around (35.20). The 2017-18 campaign was a learning experience for Mancini, who is also a Level 8 club gymnast. At the State Open, Mancini tied for ninth on vault, tied for 25th on beam and was No. 37 in all-around. She missed half of the regular season due to mononucleosis. Mancini looks forward to her second high school postseason. For Longobucco, she believes her 13th season directing the Ludlowe program will be a lucky one. Thursday: South-West Conference (SWC) Championship at New Milford HS, 5 p.m.: Newtown High School is vying for a title after posting runner-up finishes the past two years. Host New Milford looking for its third league crown in four years. Thursday: Southern Connecticut Conference (SCC) Championship at Jonathan Law HS, 7 p.m.: Can anyone stop Daniel Hand from earning its 11th straight SCC championship? Saturday, Feb. 9: FCIAC Championship at Westhill HS, 10 a.m.: Will be a battle royal as a number of solid challengers try to dethrone two-time defending league champ Greenwich High. Wednesday, Feb. 13: Eastern Connecticut Conference Championship at Deary’s, 6 p.m.: Woodstock Academy seeks its 10th consecutive ECC title.